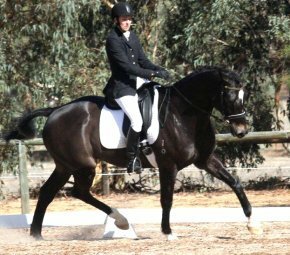 Rider/owner Sophie Roberson of Western Australia on 'Lunden' competes at the Brookleigh CIC One Star event in April 2010. 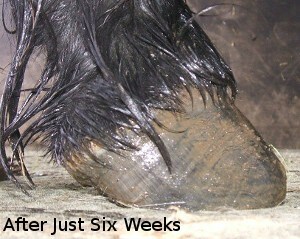 Lunden has been barefoot for many years under SHP Kris Adrian. 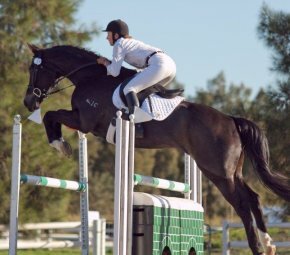 Sophie Roberson and Lunden won the 2009 West Australian "Newcomers" eventing award, are members of the Australian Talent Search Squad and have been consistently winning and placing in one star events throughout the 2010 season. This is a clyde cross. 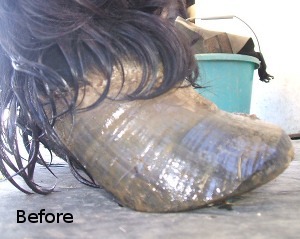 Hoof when started was so weak that his soles bled when using the hoof pick to clean out the mud, 9 months from the two photos. 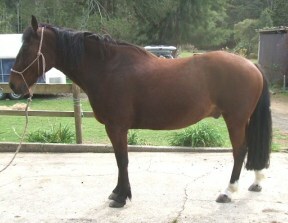 Horse is now sound with good hoof shape and strong hooves. 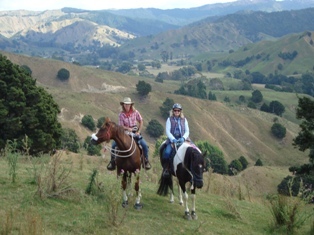 Penny Gifford, SHP, of Kumeu, and several of her clients completed an organised week-long trek earlier this year with about 100 other riders. 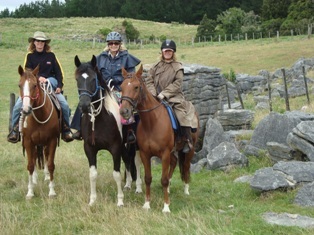 Penny's barefoot group enjoyed the trek - 180k in 7 days with a rest day in the middle through the stunning and challenging King Country of New Zealand's North Island. 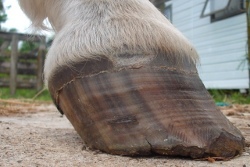 Old Mac's G2 hoofboots were used on the rocky parts. 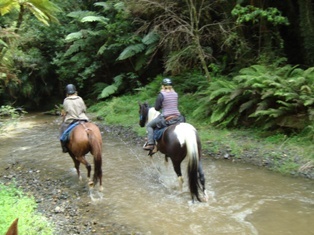 The horses in Penny's group were all barefoot using the Strasser method and completed the trek sound, with no problems and in great health. Thanks Penny for the stunning photos. 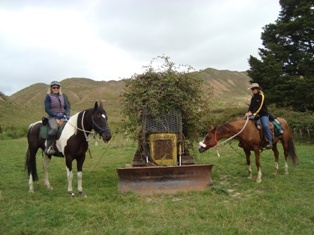 Before First Strasser Trim: (left) 14yr old gelding has been barefoot with an incorrect trim that caused him pain. 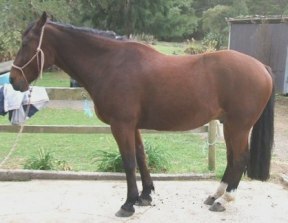 Horse standing under with front and hinds (cannon bones should be vertical). Very dull in the eyes, kind of shut off as putting up with alot of discomfort. 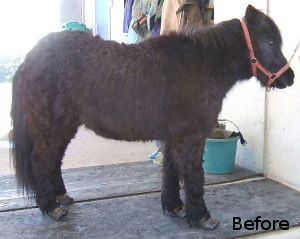 Also, he was kicking at his stomach during the trim when he had to lift a hoof and put weight on the other untrimmed one. This stopped as soon as both fronts were trimmed. Directly after first trim: (right) Much improved posture and bright interest immediately after first trim using the Strasser method. 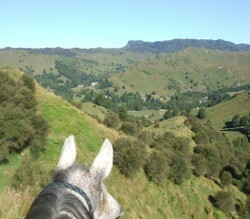 "Harlequin, 20 yr skewbald, trekked for 200km over 6 days from Taurmarunui to Mangaweka sound and in excellent condition. Old Mac boots with gaiters were tested for 2 days over 70k+ with no rubs. 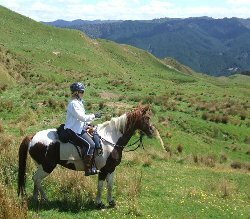 Dodge, grey warmblood, did very well in the heat over some very steep km but did get a rub in front of the girth due to sweat and was given a couple of days off and then continued and completed the trek sound and in excellent condition." 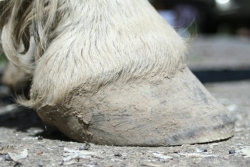 You will find Dodge's story "Incurable" Navicular. on page one of the gallery. Thanks for the awesome pics Penny. 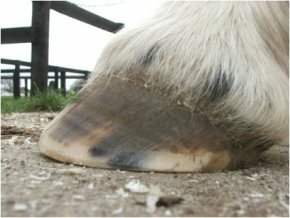 Before First Strasser Trim: (left) Long, badly contracted heels, causing seedy toe, chipping, white line separation and a twisted hoof. 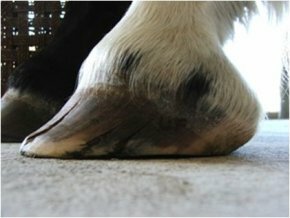 Six months later (right) Much improved heel, with horse much happier to weight his heels, posture and hoof horn quality much better using the Strasser method. 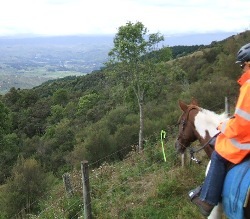 This pony was incredibly able to move around even with her long hooves. 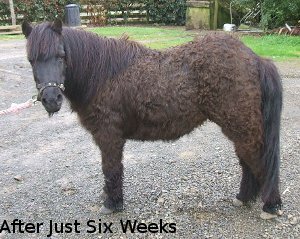 Throughout the 6 weeks that she stayed at my place she was happy and once she was trimmed became even more mobile bucking and cantering around when she felt like it. 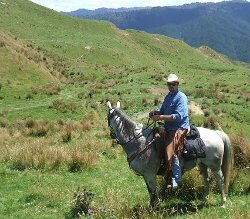 She was trimmed regularly, fed unlimited grass, quality waikato hay and 1 small feed of oats meadowchaff and MSM wet with acv and water.She also had the company of another horse and moved continuously 24/7.